Fast, high-quality printing and copying. With a print speed of up to 42 pages per minute, this multi-function copier is ideal for busy offices. Flexible network connectivity†. Built-in Ethernet interface allows you to share the DCP-L5500DN with multiple users on your network. 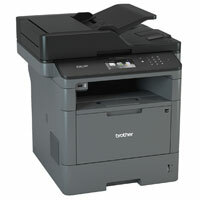 The Brother DCP-L5500DN monochrome laser multi-function copier is a great solution for offices and small workgroups. It offers cost-efficient output with its high-yield replacement toner cartridge, fast print and copy speeds up to 42ppm, and easy sharing via an Ethernet interface. Advanced security features provide network user authentication to help protect against unauthorized access. Plus, enjoy flexible paper handling with a 250-sheet capacity paper tray, a 50-sheet capacity multi-purpose tray and optional trays to increase total capacity to 1,340 sheets. Quickly scan multi-page documents to a variety of destinations with the 40-page capacity auto document feeder. Plus, a customizable color Touchscreen display provides direct printing from and scanning to popular business cloud services‡. Flexible paper handling. Easily handle your large print jobs via an adjustable 250-sheet capacity paper tray and 50-sheet capacity multi-purpose tray. Additional optional paper trays are available in 250-sheet or 520-sheet capacities enabling users to configure the multi-function copier with multiple trays in a way that best meets their application requirements – up to 1,340-sheet total capacity. 40-page capacity auto document feeder. Use for unattended copying or scanning of multi-page documents (up to legal size). Advanced scanning capabilities‡. Supports multiple scan-to destinations such as E-mail, SSH Server (SFTP), USB, SharePoint®, Cloud Services, and Network Folder (CIFS) to easily adapt to your customized workflow. Advanced security features. Active Directory® support for network user authentication to help protect against unauthorized access to the device. Other security features include: Secure Function Lock, LDAP, SSL/TLS, and more.